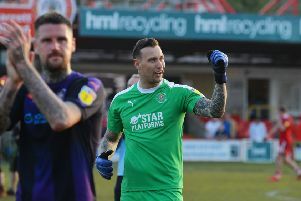 Hatters boss Nathan Jones isn’t worried by being made as one of the favourites for promotion this season, after setting his side the goal of winning the title. Town are joint third favourites at 9/1 with league sponsors Sky Bet to go up this year, but Jones didn’t feel any extra pressure from such a price as the boss has targeted lifting the winners trophy in May. He said: “The pressures we have are here are the pressures I set for myself, for the team, for the club. “They’re not pressures anyway, they’re ambitions. When you’re ambitious pressure comes with that as you have to live with your own standards not anyone-else’s. “I think we’re third favourites, okay, I’d like to win the league, so my ambitions are slightly bigger than the bookies’ ones. With plenty of teams strengthening this year, Jones knows it’s a tough division to call, and the team that can maintain their form throughout will come out on top. He added: “I think a lot of clubs have recruited well, brought good players, some have come down and there are a lot of strong sides. “This league is such an unpredictable league we have to be consistent in the results that we get and have to be positive.